Ritual Spell Cards, known as Ritual Magic Cards (Japanese: 儀（ぎ）式（しき）魔（ま）法（ほう）カード Gishiki Mahō Kādo) in the TCG prior to Magician's Force and the OCG, are a type of Spell Card used to Ritual Summon Ritual Monsters. The correct Ritual Spell Card in the hand or Set in the Spell & Trap Zone. If in the hand, a free Spell & Trap Zone to activate the Ritual Spell Card in. The corresponding Ritual Monster in your hand. A few exceptions mention that the corresponding Ritual Monster must either be in your hand or in the GY. A free Monster Zone into which to Summon the Ritual Monster, or a monster on the field that can be Tributed for the Ritual Summon in order to leave a free Monster Zone. In some early video games, Ritual Spell Cards were colored blue like Ritual Monsters in the OCG/TCG, instead of the usual green. 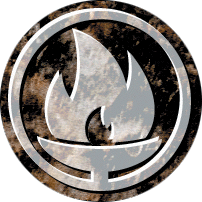 Activating a Ritual Spell Card can tend to be somewhat demanding, and for that reason Ritual Spell Cards are arguably the least used type of Spell Card. 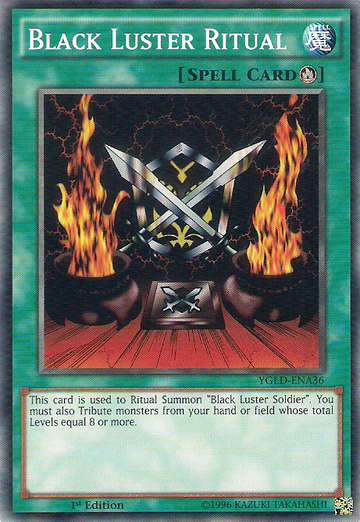 "Advanced Ritual Art" is often used due to its ability to use monsters from the Main Deck. Some Ritual Spell Cards, such as those for "Divine Grace - Northwemko" and "Garlandolf, King of Destruction", "Ritual of Grace" and "Ritual of Destruction" respectively, have secondary effects that can be activated by banishing the Ritual Spell Card from the Graveyard. The "Gishki" archetype often supports Ritual Monsters and Ritual Spell Cards in general, although tend to support their own "Evigishki" Ritual Monsters. The "Gishki", "Prediction Princess", "Black Luster Soldier", "Cyber Angels", "Vendread" and "Nekroz" are archetypes that focus on Ritual Monsters. "Forbidden Arts of the Gishki" is the only Ritual Spell Card that allows its controller to Tribute the opponent's monsters. "Gishki Photomirror" is the only Ritual Spell Card that requires its controller to pay Life Points instead of Tributing monsters. "Nekroz Kaleidoscope" is the only Ritual Spell Card that can Ritual Summon multiple Ritual Monsters simultaneously. "Nekroz Mirror", "Red-Eyes Transmigration", "Revendread Origin" and "Chaos Form" are Ritual Spell Cards that allow banishing monsters from the Graveyard instead of Tributing monsters; however, the "Djinn of Rituals" can use their own effects to allow other Ritual Spell Cards to do so. "Nekroz Kaleidoscope" and "Odd-Eyes Advent" are the only Ritual Spell Cards that allow the player to send a monster(s) from the Extra Deck to the Graveyard instead of Tributing monsters. This page was last edited on 16 June 2018, at 01:54.